I’ll admit it – eating out in a group is sometimes a big pain. You’ve got diversity of palates and appetites, different price points, and the dreaded awkward multi-person bill split at the very end (please don’t tell me that I’m the only one who has handed a waiter 7 people’s credit cards before). We do it because it’s great to catch up with friends, or you’re eating with coworkers, or well, it’s just more fun to eat with others. 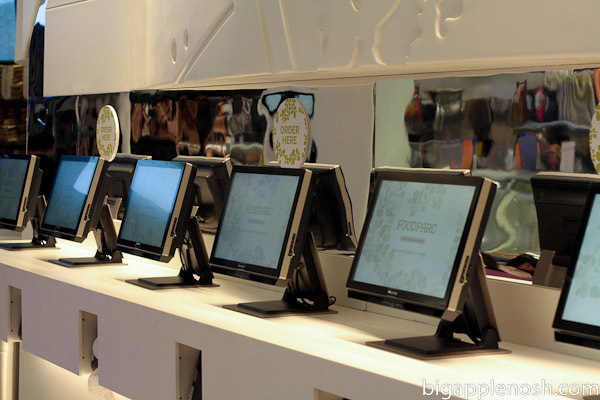 Instead of ordering at the counter, you place your order and pay at any of these monitors. Here, you can place an order for any of the four food options, as well as pay for your food. 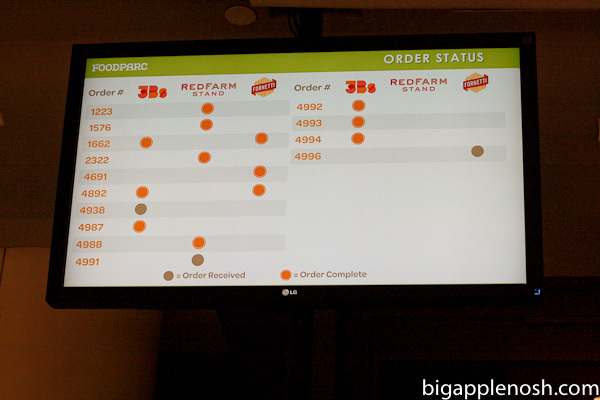 You then monitor the progress of your order on any of the screens (below) and pick it up once its ready. The whole process took less than 5 minutes. Ok, so the concept is simple yet cool, but how did the food taste? 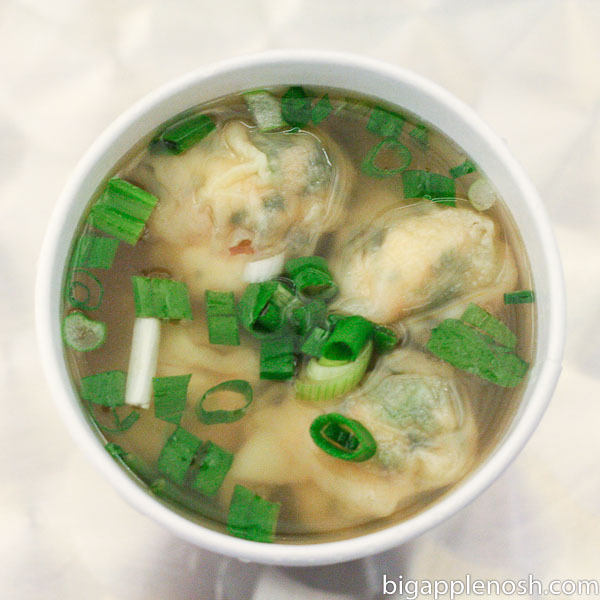 I first started off with the shrimp and watercress wonton soup from Red Farm Stand – at $4.95, it was slightly more expensive than Chinatown wonton – was it worth the extra price premium? I took a tentative bite and was pleasantly surprised! The broth was light but flavorful, and the wonton had large pieces of whole shrimp (vs. some of the mashed up shrimp you find in subpar wonton). Even my eating buddy, a huge fan of the Chinatown hole-in-the-wall deal, was won over. I then moved onto the 3Bs Special burger (first picture), with a No.7 Hanger blend, American cheese, secret sauce, lettuce, tomato, red onion, pickles, and crispy onions. For good measure, I added bacon (of course). While adding bacon to a burger is usually a routine action (wait, I’m not the only one, right? ), 3Bs upped the ante by offering FOUR bacon options. 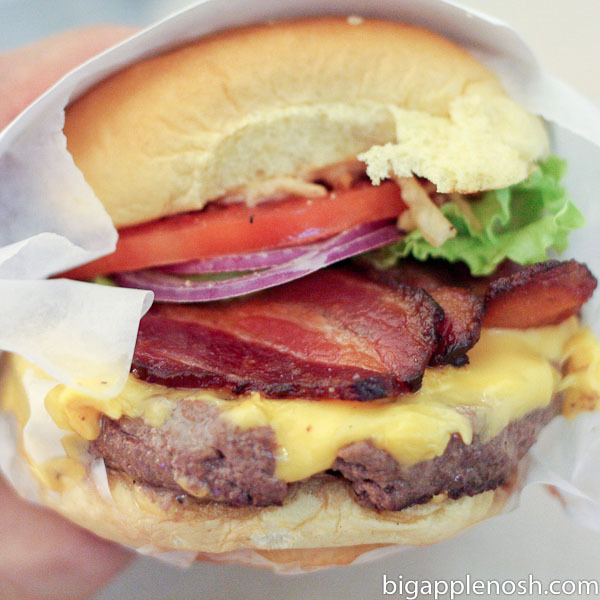 I ordered the Neuske’s bacon – thick cut and heavily smoked, it held its own in the two-hands-needed burger. Is it possible that a bacon cheeseburger can actually take healthy? I’m sure it’s not as good for you as, say, a salad (blah) – but you could definitely tell that all of this burger’s ingredients were fresh and high-quality. No greasepots here! For my beverage option, I ordered the rootbeer float from 3Bs. 3Bs uses Blue Marble organic vanilla ice cream for their floats. I admit that I was skeptical as to whether I could tell the difference between that and let’s say – Edy’s; however, I was a convert after the first slurpy bite. Dense, creamy and buttery, this ice cream definitely felt and tasted more luxurious! 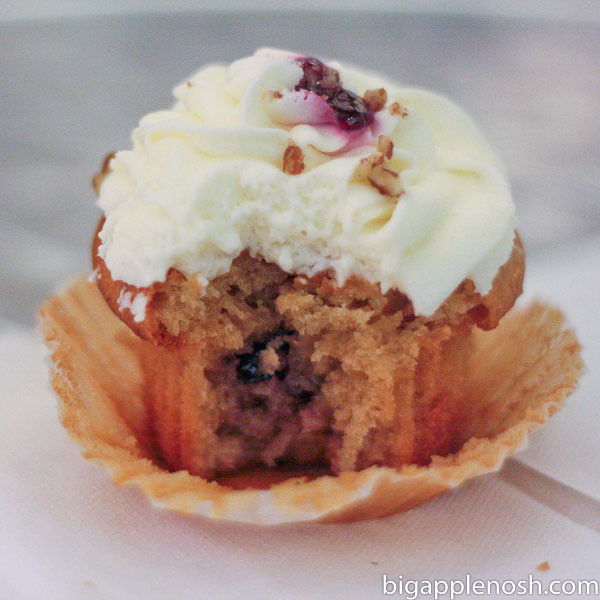 To finish off the meal (as if the rootbeer float weren’t enough), I ordered a PB&J cupcake from The Press. Yummy yummy. It was a perfect fourth course to end my FoodParc experience – mmm! FoodParc is a great option for casual dining with a group of people – the menu is diverse enough to appeal to a multitude of tastes, and there is none of that awkward bill-splitting. 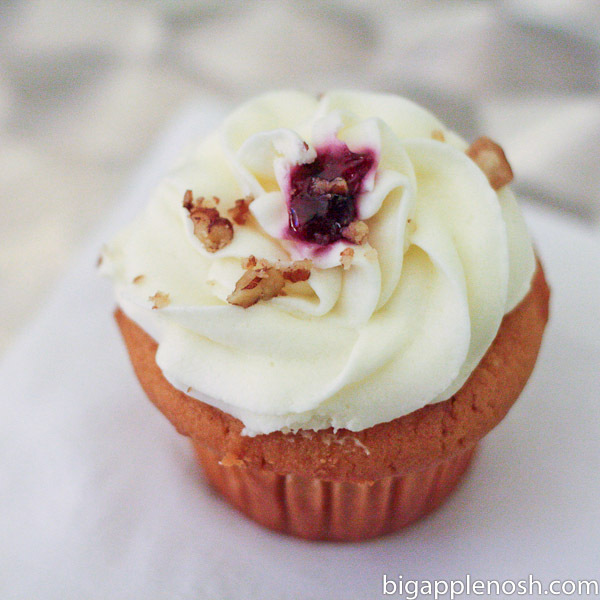 Additionally, the food is relatively healthy (ok, if you don’t do the wonton/hamburger/float/PLUS cupcake combo I did). If I worked closer to FoodParc, I would definitely frequent it for lunch on a regular basis. Quality food options at a good price. Mmm…I love the combo meal you created on your own. And, what a great idea! What a unique and wonderful concept for a restaurant! 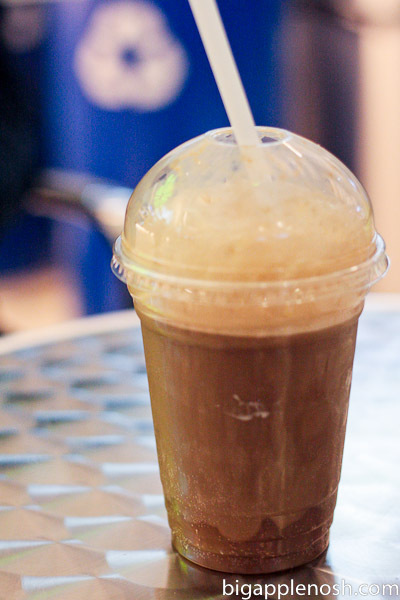 And I'm intrigued by the root beer float – looks delish! Excellent! I agree, figuring out how to exactly execute "going dutch" in a group is a pain. This reminds me a lot of ordering from food courts in Asia! i haven't eaten there yet, but i did stop by to check it out. it's pretty crazy in there. i wish i worked close by so i could try it out. Wonderful! Everything look so good! I'm glad you took that photo of the inside, I've heard good things but was curious of the look. This looks so cool! Will have to check it out! This place looks really neat! And I love checking out new cupcake flavors, that one sounds really fun. I love how creative people are being with cupcakes lately, but I totally agree, they are either great or awful! I want to try that soup! Got to get there soon.